I have always had an issue logging into YouTube from my iPhone to upload video from my camera roll. No matter how many times I tried, I would get an error that it was unable to authenticate. I finally realized that the issue was my two-step verification with my Google account. The YouTube login on phones doesn’t allow for the full process to run, so it was just bouncing back as invalid. My fix was to go into my Google account settings and create an application specific password for YouTube on iPhone and use that password. Worked perfectly and solved a huge headache! 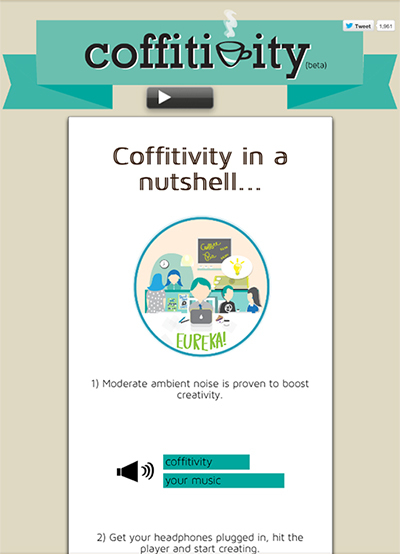 Ambient noise has been proven to increase creativity and the team at Coffitivity are aiming to bring that to you on your desktop. I recently came across Coffitivtiy, whose aim is to boost your creativity. Still in Beta, it simply provides ambient noise, recorded from a coffeehouse that you play in the background with your normal music at a slightly louder volume. After using it for a couple of hours in the background of my normal music, I can’t say I all of a sudden came up with world-changing ideas (though I wish I had) but I did notice an increase in focus and ability to get stuff done, just as if I was working somewhere with a lot of ambient background noise. This helped me because there is currently only three people who are physically in our office everyday and it gets rather quiet in here, which is never a good thing. I’m going to continue using this and see where they go from here! After adding my modifications to make it a standing desk. Since I’ve been working as a web developer full-time, my back has been killing me from sitting at my computer all day. Typing hunched over my computer was causing me pain to the point where I would have to get up, stretch and try and rub my back every 15-20 minutes. That was no way to work. I had been looking into the idea of a standing desk for a while when one of my co-workers started doing it. After a week, he was raving at how much better he felt, so I decided to give it a shot. Originally I just used a small shelf stacked on top of my desk with my laptop set on it. The first couple of days, my feet were in a lot of pain from standing, but I could tell a difference in not only my back, but in my overall mood and energy. I felt that I had a little more pep and wasn’t getting my 2:00 crash. I also felt that I was more alert and excited. At the one month mark, I got a standing mat to add a little cushion to the floor and it made a subtly but huge difference throughout the day. My desk when it was still a normal sit down desk. 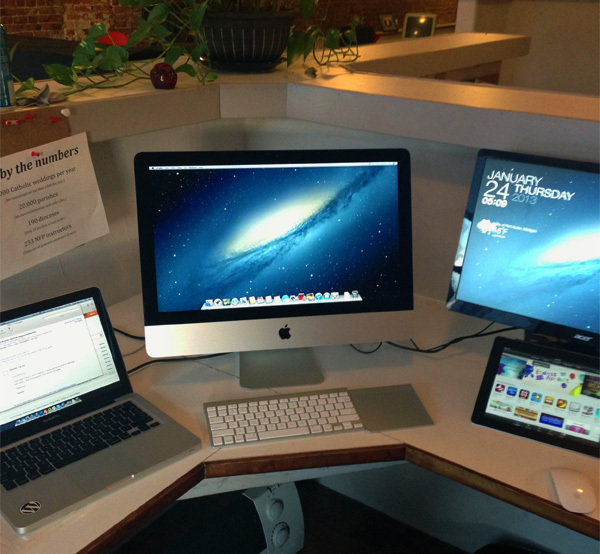 Finally, after getting a new iMac which didn’t fit on the shelf I was using, I looked for a more permanent solution. Since my desk is built into my office, I couldn’t just get or build or a normal standing desk. Instead, I found a table that matched the height I needed, then added a shelf to set my keyboard and mouse on. It just so happened that one of the coffee tables from the department store was the right hight for my monitor and was only around $20. I picked up a couple L-brackets and a shelf for about ten dollars more. Now I have the perfect standing set up for me, and it only cost about $30 to do. I feel great and couldn’t imagine going back. 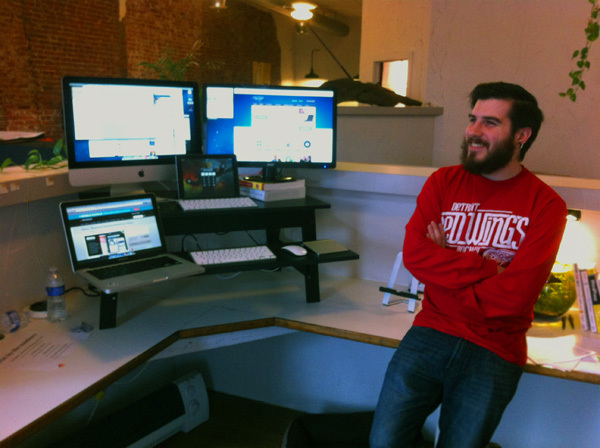 Edit: The Times Herald, a Gannett Company in Port Huron, Michigan, wrote an article about standing desks. Read about it here. I love coming to work. Every day. Really, I don’t consider it work. I’m lucky enough to be employed somewhere that I get to do some really cool things. Since I started at Marriage Ministries around August, I have learned more and done more than I did in the years prior. Everyday we are doing something new and exciting and it has been a great learning experience for not just me, but everyone else there. I also get to wear many hats. On any given day, I could be doing our websites, or handling our social media, or creating some advertisements, or doing some marketing, or even be taking phone calls from customers. For me, that is excited in itself because I get to jump around between projects, which I love to do. Everything I do, big or small, has an impact on the company. Being a startup, it’s not the kind of place I could just come in and twiddle my thumbs until 5, then head home. If I do nothing, it shows and the company suffers. But if I do a lot, it shows and the company soars. This was originally just going to be a post of a picture, but as it was loading, I started thinking more about what I do and what it means. Work hard, play hard. 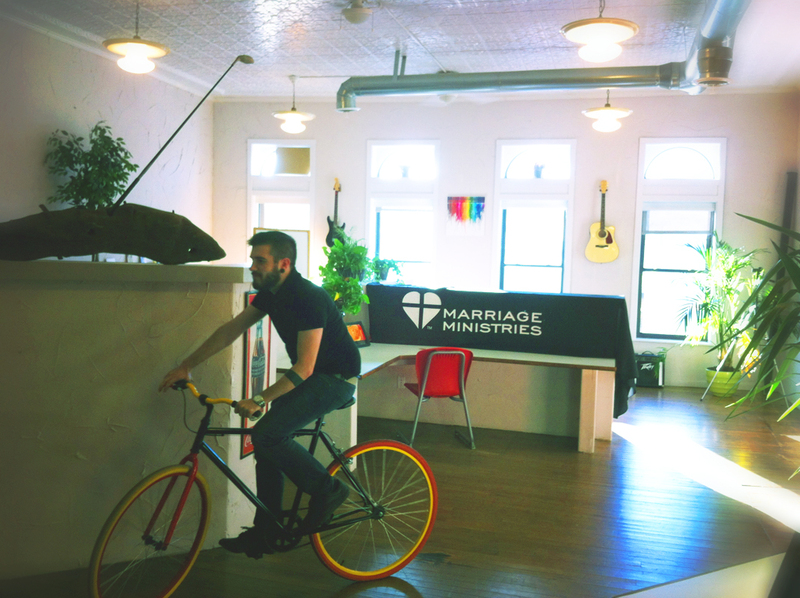 We work hard to do meaningful things, but have a great time doing it and cut loose to enjoy our time. After losing the database all other information to my site when switching servers I was left with a blank page. Literally. This gave me a chance to re-build the site from the ground up. My site design has always focused on simplicity, but this time I wanted to take it to a whole new level. That’s where the new design comes from. I got really inspired by the bare-bones look of the 37signals Signals vs. Noise blog, which is a great site and displays awesomely on mobile devices. I built this theme with mobile in mind, letting it resize gracefully depending on which type of device the user is on. Another thing I did was a large type size. It is significantly larger than any other version of the site, which I feel helps with readability and focusing on the words. Let me know what you think of the site! I’m pretty excited about it. I was recently in the process of switching servers and apparently during backup, I managed to grab everything except the database for my sites. This means I now have to create it all from scratch. Oh well I guess. It was long overdue.